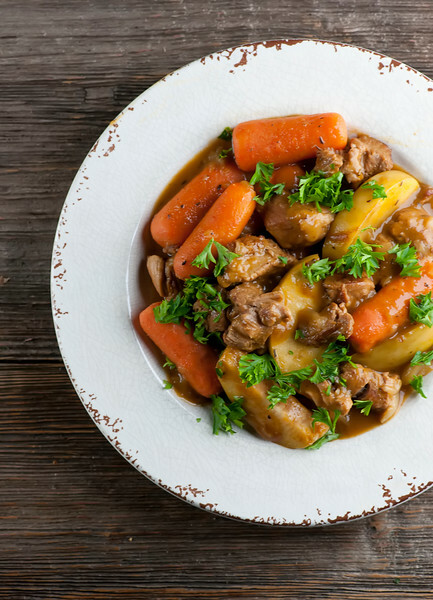 This easy recipe for veal stew with apples is the perfect answer to a frosty winter night! A warm, hearty supper that also makes great leftovers. We’ve been spoiled up here in the Northeast with more than our fair share of unusually balmy weather, but I know that sooner or later winter is going to settle in for good, and I am going to be all prepared with some veal stew with apples. 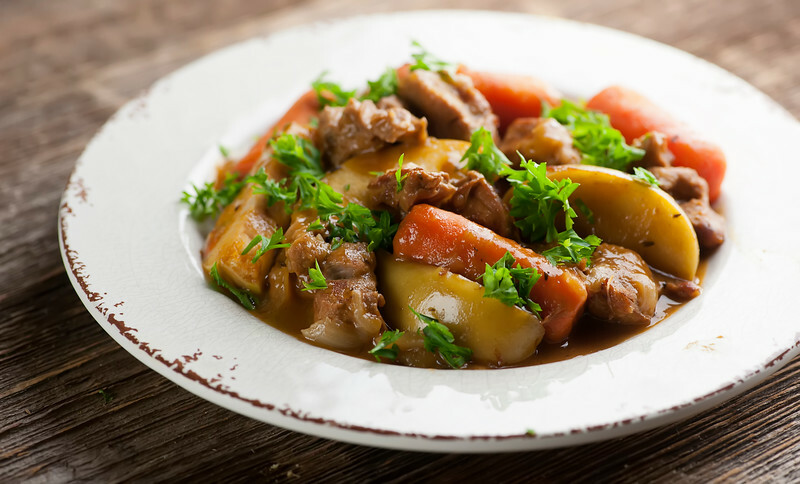 I love a hearty traditional beef stew, but every once in a while I like to do this variation, which is a little lighter and has a sweet hint of apple taste. It’s the perfect thing to have simmering on your stove when there’s a chill in the air and you need a little extra something to make sure you are nice and warmed up. It’s also an easy and welcoming recipe to make when you are going to have a houseful of friends and family during the holidays, and you want to make sure they have something extra delicious for supper. One of my favorite parts about this stew is the apples. 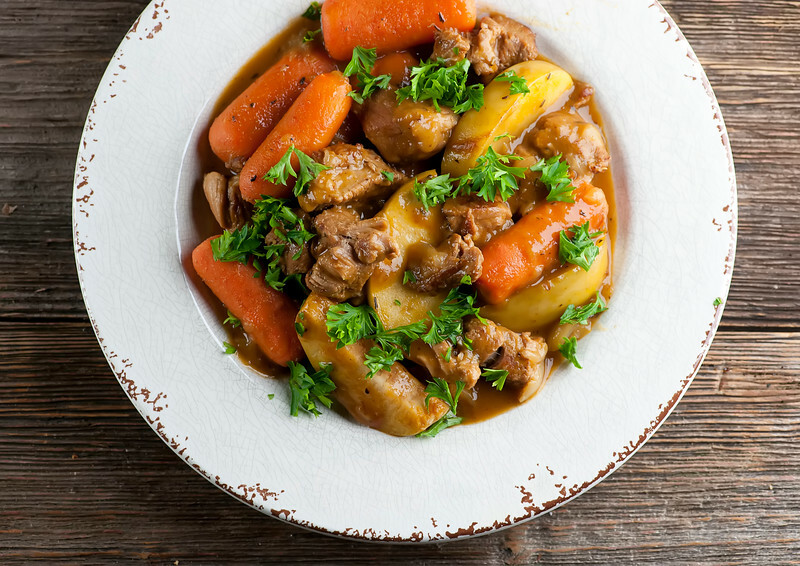 They stand in for the potatoes that you usually find in a beef stew, but of course they are sweeter and lighter, while still giving the stew just the right amount of substance. You can use any variety you like – the Southern husband is currently a big fan of Honeycrisp apples so that’s what I’ve been using lately. 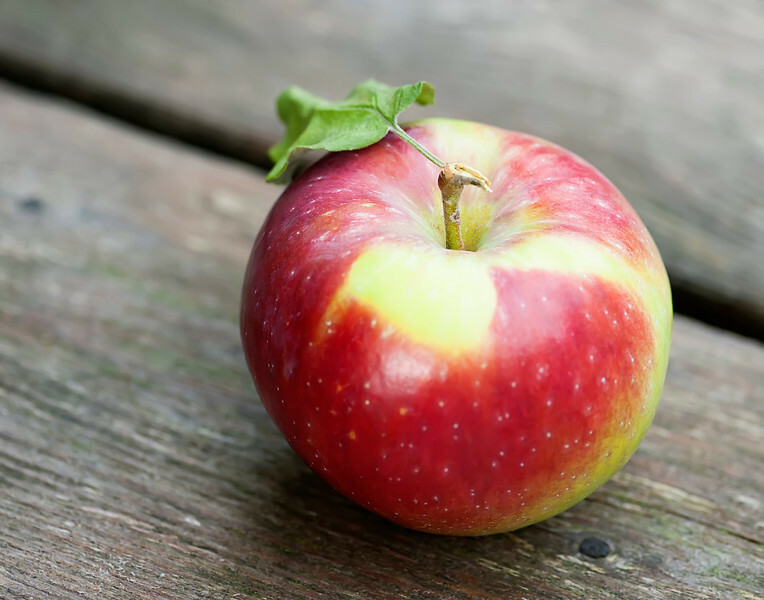 I also love the taste of Macintosh apples, although they get a little softer than other varieties. You be you, apple-wise! The other thing I love to do with this or any other stew or soup during these frosty days and nights is to warm up the plates. Pop them into a 150 degree oven for 10-15 minutes and they will be nice and toasty. Warm plates help to keep the food at a nice temperature right up to the very last bite. And I promise you are going to want every last bite of this one! Heat 2 tablespoons olive oil in large skillet. Saute onion until tender, about 3 minutes. Transfer to 5 quart Dutch oven. Add another 2 tablespoons olive oil to skillet and brown the veal over medium high heat, working in batches and adding more oil as needed. Add to Dutch oven. Lower heat under skillet and add 2 more tablespoons oil and the flour, stirring to make a paste. Add broth and cider, and stir up brown bits from the bottom of the pan. Add thyme and tomato paste. Simmer for 5 minutes. Pour sauce over the veal in the Dutch oven. Cover and simmer for one hour. Uncover and add apples slices and carrots and simmer for another 50 minutes, stirring from time to time. You’re right, it’s starting to get chillier and I just know we could all use some of this stew :) I feel warmer already just looking at it. Hope you have a warm weekend, Kate dearest! !